The flue pipe installation is often the weak link in a wood burning system. Make sure yours meets all the applicable code safety rules. These rules are based on the CSA installation code used in Canada. For the exact rules in your area, check with a local building inspector, wood heat retailer or chimney sweep. The ideal flue pipe assembly is one that rises straight up from the appliance flue collar and directly into the chimney with no elbows. The system at the left is single wall pipe with an inspection wrap (pipe coupler) to allow it to be assembled and disassembled without moving the stove. A sealed double-wall pipe is a good choice to maximize draft and minimize creosote deposits. Use sealed double-wall pipes if the assembly must be long or if the appliance is expected to produce low flue gas temperatures. The system above right uses a sealed double wall telescopic length between the stove and chimney. A vented double-wall pipe allows cooling air to pass between the inner and outer layers. Where the flue pipe assembly is short and straight, a vented double-wall pipe can be acceptable. However, vented pipe is not a good choice for longer flue pipe assemblies or for appliances such as central heating appliances that tend to produce low flue gas temperatures. Certified double-wall flue pipe systems are also available. These systems are tested to determine the minimum clearance at which they can be installed. The clearance information is found on the labels attached to the pipe and in the manufacturer’s installation instructions. The rules for their installation may differ from the rules for single-wall flue pipes. The minimum installation clearances for certified double-wall flue pipes are much less than those for single-wall pipes. Also, the maximum length of a double-wall flue pipe assembly may be greater than is permitted for a single-wall pipe. A WETT certified inspection is an inspection that must be conducted by an inspector who is WETT certified. A general home inspector must take a course to become WETT certified. The course typically consists of 4 to 5 days of training as well as 80 weeks of field experience before they receive certification. While a typical home inspection will provide a visual inspection of the fireplace, chimney and hearth, a WETT Certified inspection includes an inspection of all the elements of any wood burning technologies in the home to make sure that they are installed correctly and are installed with compliance to CSA Standards, building codes and fire code regulations. 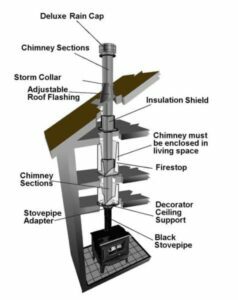 It should also include a visit to the roof to examine the chimney for any potential structural or ventilation issues. WETT Certified inspections are more than just something to offer you peace of mind, if wood-burning appliances are a part of your home’s features, it is of paramount importance that these appliances are both installed properly and inspected for your safety. The Barrie WETT Inspection Service has been inspecting Wood Burning Appliances for over 15 years. Call Roger at 705-795-8255 for a WETT Inspection in Barrie, Orillia, Alliston, Stayner, Wasaga Beach, Angus, Thornton, Innisfil or Everett.